Foe will become friends tonight – for 60 minutes at least – as the GTHL’s top 42 minor midget players come together for the 7th Annual Scotiabank GTHL Top Prospects Game at Scotiabank Pond (7:30 p.m., $8 in advance, $10 at the door). Members of the Toronto Marlboros and Mississauga Rebels – two of the top three teams in Minor Midget AAA – will have to put their Kraft Cup differences on hold, as a combined 15 players from the two clubs will lead Team Graves against Team Corson. The Team Graves roster will be rounded out by four Don Mills Flyers – defenceman Declan Chisholm (No. 6,) and forwards Jack McBain (No. 8), Tyler Weiss (No. 9) and Wyllum Deveaux (No. 10) – along with Mississauga Senators goaltender Christian Purboo (No. 30) and defenceman Roman Semin (No. 7). Friends will also become foe during the showcase, as Purboo and Semin face off against teammate Curtis Douglas, who will wear No. 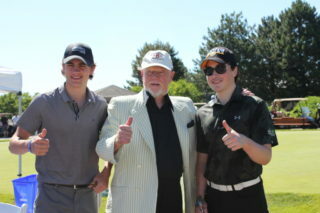 18 for Team Corson. 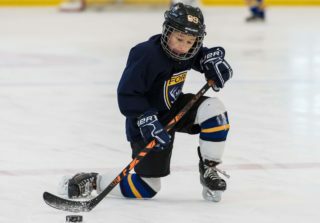 Douglas will be joined on Team Corson by seven Toronto Red Wings; six Toronto Jr. Canadiens; three members each from the Vaughan Kings and Toronto Titans; and Markham Majors forward Liam Foudy (No. 17). 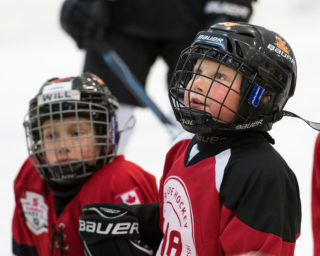 The two rosters will each be led by a duo of celebrity coaches led by team namesakes Adam Graves and Shayne Corson. The game also pits NHL Alumni brothers Wayne and Keith Primeau against each other, as they join Graves and Corson, respectively. Jr. Canadiens defenceman Ryan Merkley is set to become just the second player in GTHL Top Prospects Game history to play in the game twice. He will be looking to avenge a defeat with Team Kypreos-Graves at last year’s event in which the club had their two-goal lead erased in the third period of an eventual 3-2 loss to Team MacLean-Clark. The only other player to suit up in the event multiple times is former Flyers goaltender Jack Lafontaine. He helped backstop Team Kypreos to a shutout win in 2012-13 and then earned Team Graves MVP honours in a 6-5 SO win in 2013-14. In total, 289 players have been named to a GTHL Top Prospects Game roster. Of the 247 alumni, 143 have played at least one game in the Ontario Junior Hockey League (57.9%); 141 have played in the Ontario Hockey League (57.1%); and 37 have been selected in the NHL Draft (15.0%), including 13 in the first round. The first overall pick in the OHL Priority Selection has been a GTHL Top Prospects Game alumnus three times in the six years since the inaugural event. Current Edmonton Oilers forward Connor McDavid was the top pick by the Erie Otters in 2012, followed by Jakob Chychrun – one of the top prospects for the 2016 NHL Draft – in 2014 (Sarnia Sting). Last year, David Levin was named to a roster (but missed the game due to injury) before being selected by the Sudbury Wolves with the top pick. Tickets can be purchased online for $8 in advance or $10 at the door. Warmup begins at 7:00 p.m.
Rogers TV will air the game on Sunday, Dec. 20 at 8:00 p.m. on Cable 10 (Toronto) and Cable 63 (Scarborough). The Mississauga Rebels are riding a five-game winning streak into the Scotiabank GTHL Top Prospects Game following a pair of one-goal decisions last week. 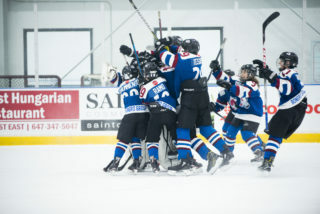 The Rebels, who rank second in the League with a 1.55 goals-against average, posted a 1-0 shutout against the Don Mills Flyers on Thursday before edging the Vaughan Kings 2-1 on Sunday. At 14-3-5 (33 points), the Rebels are tied for second place with the Toronto Red Wings (16-5-1, 33 points). 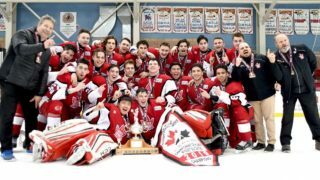 The Red Wings have won back-to-back games – including a 3-1 decision against the Mississauga Senators – to rebound from a three-game losing streak that caused them to lose their top spot in the weekly team rankings for the 2016 OHL Cup. The Toronto Marlboros, who pace all clubs with eight players in tonight’s GTHL Top Prospects Game, sit alone in first place with a record of 18-3-2 (38 points). 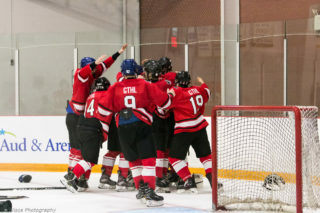 They cruised to a 7-1 victory Friday against the Toronto Young Nationals.